This letting go thing is hard. It's always been hard, and I don't expect it will ever get easier. 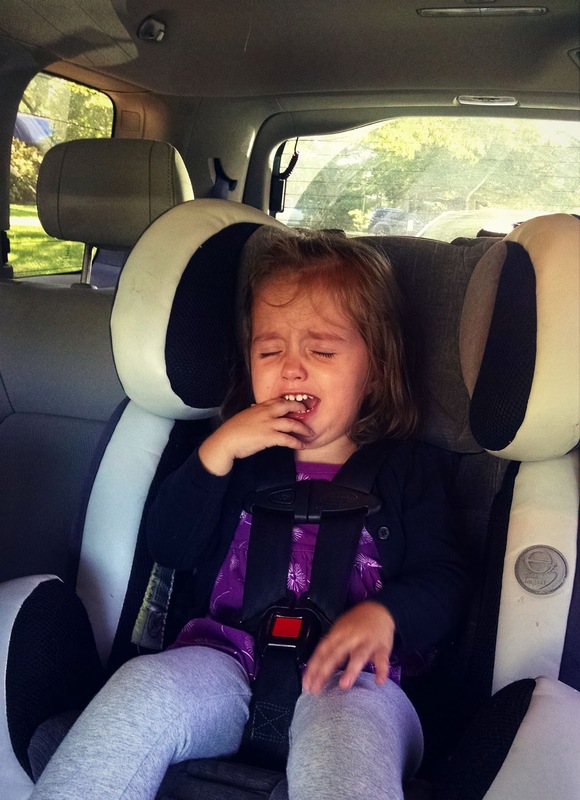 It's hard to let go of your child for any length of time, and it's even harder when you know you must. Now, for the record, I know that kids don't have to go to PreK. But I do know my particular kid, and she needs to be out of the house a couple times a week, in a classroom setting. My particular kid is ready for that (even if Maria and I are not). When we were making the decision last year, we knew we wanted to sign her up in some kind of class this year, and we didn't want to have to be driving all over the city to get her to class (which is what we did for Catechesis of the Good Shepherd last year). 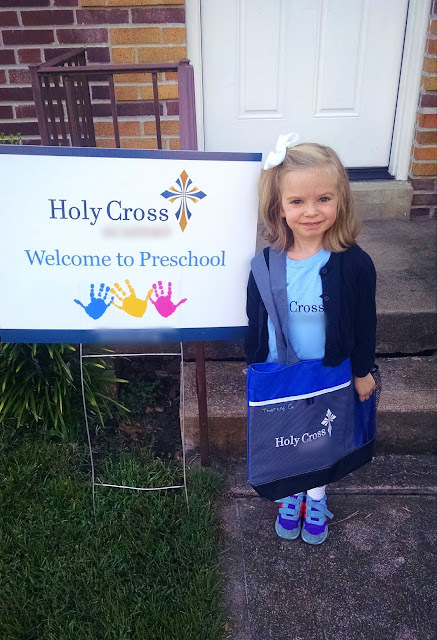 So, sending her to our parish's super flexible, play-based preK was a no brainer. But it doesn't make it any easier, of course. 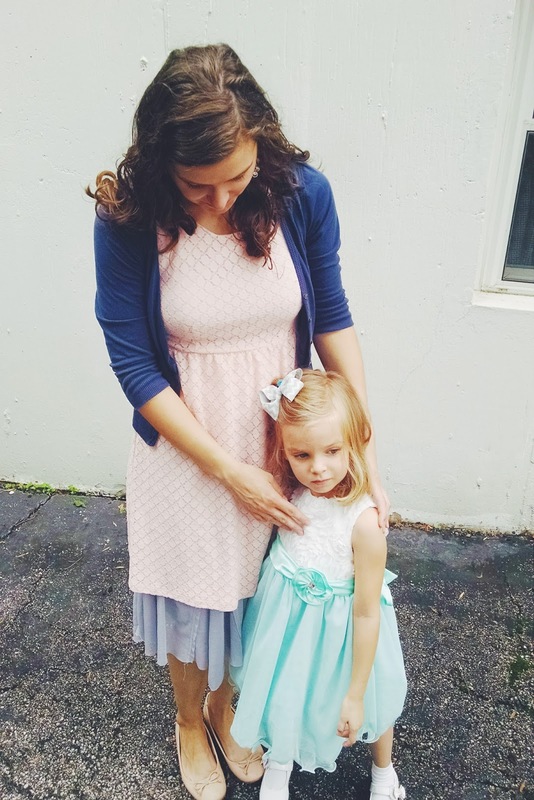 The night before she started school, I read Blythe's post, and it felt like she'd crawled into my brain and had a look around. I just want my little girl at my side forever, but even if/when we homeschool, that's not the version of school we want for her. We firmly believe that homeschooling (in our family, and for this child especially) needs to be coupled with a classroom experience. I don't know how that will work from year to year (or even if that will change next year), but that's what we're committed to right now. So, what that means is that the little girl is still insisting on doing her "reading lessons" with Mommy when she gets home. It means she still has a little desk set up next to mine. It means that I'm still ordering curriculum and school supplies. It means we're going to try to do "both and." Both school and homeschool. Because if she likes both, why can't we let her have both? A classroom experience two mornings a week, and homeschool the rest of the time? I'm writing this nonchalantly, but you better believe I cried more than a few tears after the girls went to bed last night. It's so hard when you've discerned the direction you think God is leading your family in, and it's not something you're sure about. But I think that's what parenting is all about, right? It's about learning the balancing between loving and knowing when to let go. It's such a hard lesson to learn. And really, whether it was sending her to PreK or co-op or another year of Catechesis of the Good Shepherd - I would feel it. I would feel that aching tug when she wasn't at my side. This is love. This is what #lovewins really is, I think - when you love even when it's painful. Even when it's hard. When you love enough to do what's best for the other person. It's just so hard. Why couldn't her best be to just live in my lap forever???? I did start something yesterday that I want to continue doing with her whenever she goes to school or any class away from home. I snuggled with her on my bed and I asked her all about her day, and all about what she liked and didn't like. I tried to make it a safe space for her - didn't act upset or shocked by anything she told me. And it worked! I could see her unwind as we talked. She needed to process it, and I needed her to know I was there to help her process it. It's the beginning of a new stage in our relationship, I think. On a fun note, I'm fairly itching to order the rest of the supplies for her Kindergarten curriculum. (Did I mention I just found out the other day that the husband of one of my friends was family friends with the founder of Mother of Divine Grace?? How cool is that??) I'm not going to try to do it perfectly. I'm just going to do my best to facilitate some one on one time with her while the little one is napping, and to work at her pace. She loves doing workbooks and lessons with Mommy, and I love doing it with her, too. So for now...keep on keeping on? Linking up with WIWS, like usual.